Spring is around the corner, and that means the City of Spokane is ramping up for this year's Spokane Gives Week (April 25 - May 3). The annual kickoff event, called Cleaning from the Core (CFTC) is on Saturday, April 25. Mark your calendars and help out with projects that aim to clean up the Downtown core! 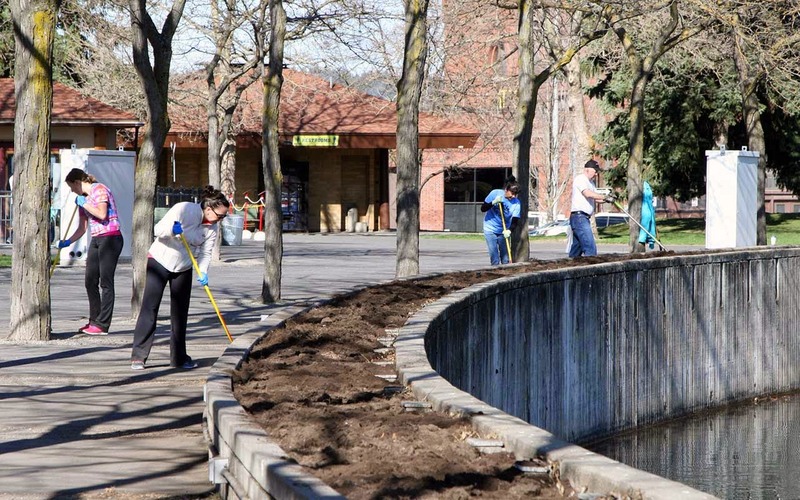 In 2014, over 400 CFTC volunteers spread out across Downtown Spokane to clean streets, sweep sidewalks and remove trash, removed green debris along I-90, paint the Skate Park, take part in annual flower plantings, and remove trash and clean up graffiti in River Front Park. The volunteers helped remove 4,620 pounds of trash from the Downtown core -- 3,400 pounds more than 2013's Cleaning from the Core! This year, the City is planning an even bigger cleanup effort with more varied projects. Some of the new activities planned for the event include a larger effort for graffiti abatement across the entire Downtown core, trash removal and the planting of 2,000 new tree seedlings along the Spokane River with the help of Spokane Riverkeeper. As a thank you to our volunteers, CFTC is hosting an After Party at The Tribal Gathering Place next to City Hall (808 W. Spokane Falls Boulevard) with food from local food truck vendors, the Shameless Sausages and 3 Ninjas. The event will also include music and raffle items donated from local businesses including Liberty Ciderworks,Riverfront Park, River City Brewing, No-Li Brewhouse, The Davenport Hotel and many more. Raffle items will be announced about every five minutes from 12-1 p.m. You must be present to win. Volunteers will also get a chance to meet Mayor Condon at the After Party.